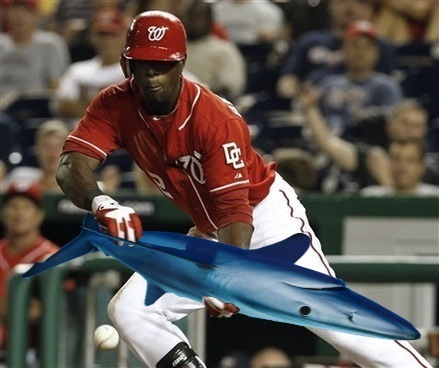 Roger "The Shark" Bernadina was back in the starting lineup, playing centerfield for the Nationals today. With the exception of an at-bat and a couple innings in the outfield during Sunday's game, the Shark had the weekend off. The extra rest did some good. The Shark went 1 for 2 with a game tying RBI (it was from a walk...but still counts) during today's 14-9 trouncing of the Houston Astros. Using his 'Usain Bolt'-esque speed, Shark led off the game with a bunt, then promptly stole second base. His stats in the leadoff spot have been sparkling this spring and I look forward to seeing him play there in the regular season. One thing is sure, Shark can bunt. Reporters claimed that Roger Bernadina kindly refused the bat offered to him by the ball boy and then pulled a blue shark out of his locker. Before anyone could protest, the Shark had laid down a beautiful bunt and was cruising into first base. this blog is great and you need to make t-shirts. thanks. Yer nuts - but funny as hell. Good job.